Made a smal canvas. Made tags from al kinds of stuff with the gelli plate. Then put some junk & some flower from the scrap table together on it. Purple was the color of my nice dress. Me @ 8, holding a birthdaycard. Love that memory. Its a beauty!! ♥ Thanks for playing along with us at More Than Words. Thanks for playing along with us at More Than Words and for sharing your gorgeous canvas. Love the tags you made and the pops of purple. I love the texture and the colour. Thank you so much for playing a long with our More Than Words challenge. Oh I love that photo too! Your large tags are fabulous and I love the way you've added the touches of purple. So glad you could join us at More Than Words. I love your background so much ! 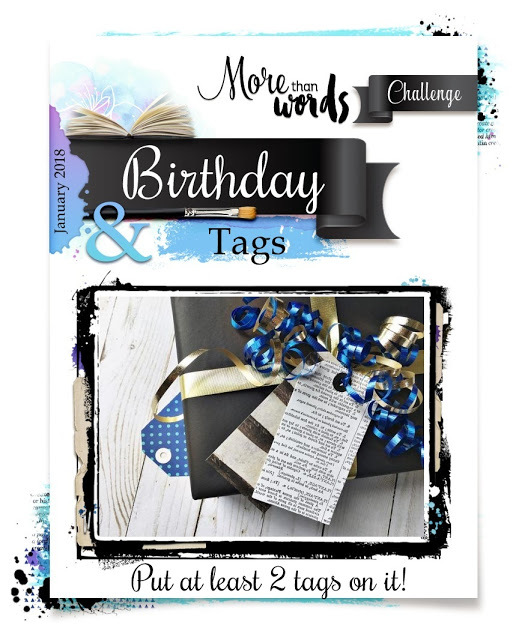 !And the layers of Tags !! Beautiful harmony of photo with background !! Thank you so much for playing with us at More Than Words. So very pretty! Love those colours! Thank you for playing along with us at More Than Words! Gorgeous work. Thank you so much for joining us at More than Words this month.